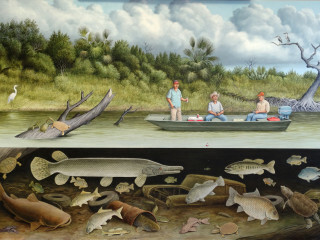 In this exhibition, The Wilds of Texas, William Reaves | Sarah Foltz Fine Art offers a long-overdue visual homage to the splendid legacy of naturalist painting in the Lone Star State by recognizing five Texas painters, a contingent from across the state who represent the state’s foremost contemporary naturalist artists. Their varied works present broader, more painterly, twenty-first century interpretations of Texas wildlife and their environs, as they continue to approach their task with refined expertise and avid dedication to the causes of both art and nature. The exhibition is rich and pleasing in terms of its divergent style and substance, and the artists and their work are certain to appeal to the inherent naturalist instincts that remain deep in the heart of every true Texan. Participating artists in The Wilds of Texas include Margie Crisp and husband, William Montgomery (Elgin), Keith Davis (Austin), Billy Hassell (Fort Worth), Debbie Stevens (Cypress) and William Young (Palestine), and together they present a remarkable fare.